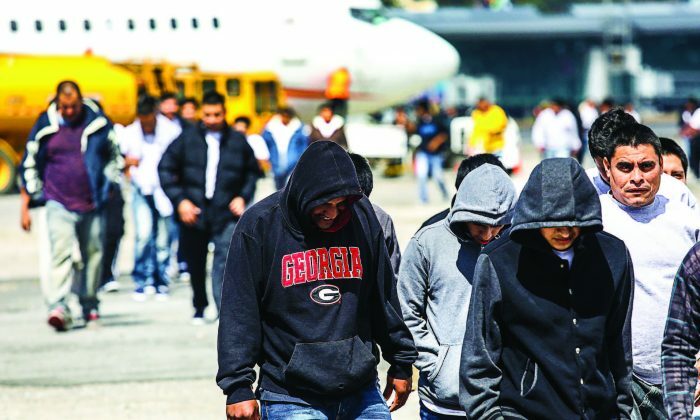 WASHINGTON—A reinvigorated Immigration and Customs Enforcement (ICE) has deported 37 percent more illegal aliens from the interior of the United States since Jan. 20 this fiscal year compared to the same time in 2016. Since President Donald Trump’s inauguration, more than 61,000 illegal aliens have been removed and more than 110,000 arrested inside the country—a 42 percent increase compared to the same period last year. These numbers reflect the most significant change in immigration enforcement strategy. Under the Obama administration, an illegal alien had to have a criminal conviction before ICE was allowed to place an immigration hold on them, “which means [an illegal alien] could be arrested for a serious crime and be in a county jail—we weren’t even allowed to put a detainer on them—even though they were in the country illegally and were arrested for a significant crime. 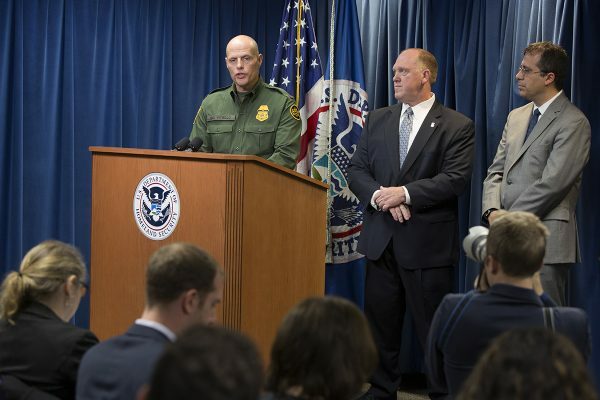 That was bad,” said ICE Deputy Director Tom Homan, at a press conference on Dec. 5. We arrested more criminals this year than last year, which kind of takes the wind out of the sails of people who say we don’t prioritize criminals anymore. The Trump administration has made it clear that no illegal alien is off limits from immigration enforcement. From the day Trump took office to the end of this fiscal year (through Sept. 30), more administrative arrests occurred than in all of fiscal 2016. An administrative arrest is the arrest of an alien for a civil violation of immigration law, and it is subsequently adjudicated by an immigration judge or through other administrative processes, according to ICE. “If you choose to violate the laws of this country, you should be concerned that ICE is looking for you—that’s the way it’s supposed to be,” said Homan. ICE’s Enforcement and Removal Operations (ERO) made 143,470 administrative arrests in fiscal year 2017, with a significant uptick beginning after Jan. 25 when Trump issued his first executive orders on immigration. Under the new administration until the end of the 2017 fiscal year, administrative arrests increased 42 percent compared to the same period last year—from 77,806 to 110,568. Ninety-two percent of those arrests were aliens who had a criminal conviction or a pending criminal charge, were an ICE fugitive, or had illegally re-entered the United States after deportation (a felony). Homan said the remaining 8 percent of the interior arrests were “collateral arrests” in so-called sanctuary cities. Sanctuary jurisdictions are cities and states that have created policies to shield criminal aliens from immigration enforcement. Often, these places forbid local or state law enforcement to cooperate or communicate with federal immigration authorities, such as alerting immigration when a criminal alien is being released from jail, or allowing immigration agents into county jails to take custody of an illegal immigrant. “When you release a public safety threat to the public, that is just foolish. It’s stupid,” Homan said. Officials who support sanctuary cities say the policies foster trust in immigrant communities, making it more likely that immigrants will report crime to the police. However, most officials do not distinguish between legal and illegal immigrants in this case. Homan said in sanctuary cities where ICE is not allowed to pick up criminal aliens from jails, the agents are forced to find them and arrest them in the community. “Chances are, when we go to their homes or place of business, we’re going to find other illegal aliens that weren’t even on our radar to begin with. Now they’re on our radar,” Homan said. While interior enforcement has gone up, the total number of illegal aliens removed from the United States (226,119) was down 6 percent from fiscal 2016. 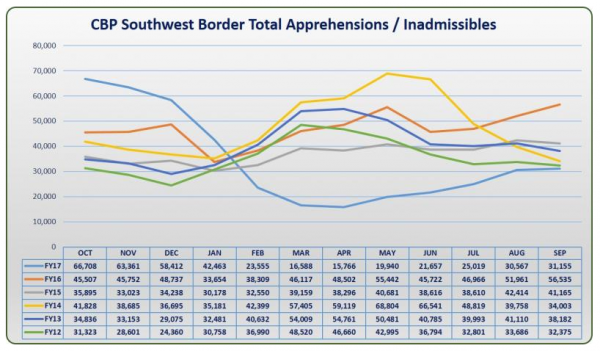 The overall drop is attributable to the decline in apprehensions at the southwest border. Apprehensions experienced a 45-year low during the first part of the year. However, the numbers have been increasing steadily since June. Of all the arrests made by Customs and Border Protection during this fiscal year, 303,916 of 310,531 were made along the southwest border. This compares to a total of 408,870 southwest border apprehensions in fiscal 2016. Despite the almost 26 percent drop in apprehensions year over year, agents along the southwest border are still arresting an average of 1,000 aliens per day as they try to enter the United States illegally, according to Ronald Vitiello, acting deputy commissioner of Customs and Border Protection. Most of the unaccompanied minors and family units hail from El Salvador, Honduras, or Guatemala. And the vast majority are processed by Border Patrol agents and subsequently released into the United States with an immigration court date set years in the future. It takes an average of 682 days to complete a single immigration case, according to the White House. Both Homan and Vitiello reiterated the need for border fencing along the southern border. “In this society and in all of our lives, we use walls and fences to protect things. It shouldn’t be any different on the border,” Vitiello said. He said the priorities are in the Rio Grande Valley, Texas, where the vast majority of illegal aliens are entering, and in San Diego, where portions of the current fence need fixing. 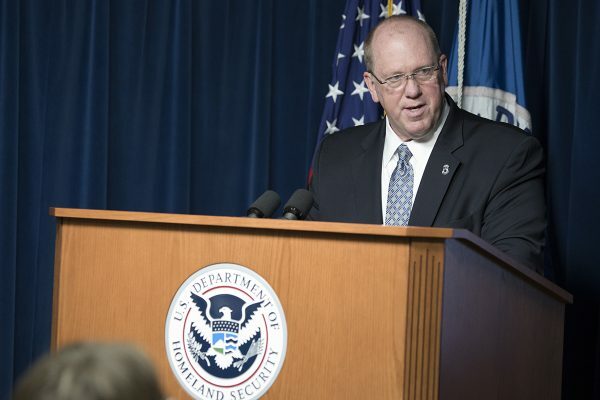 Homan said a wall is a wise investment and touted the effectiveness of the walls in San Diego, El Paso, and in the state of Arizona, where the numbers dropped sharply after construction. “Every place they built a wall barrier, it has decreased significantly the illegal crossings. Why would we not want to build a wall? What is the cost of national security and public safety?” Homan said. In October, Trump outlined his immigration priorities, which include tighter border security, more interior enforcement, and a merit-based immigration system. His enforcement priorities followed existing immigration laws, but with the addition of mandatory e-verify, a program to stop employers from hiring aliens without work authorization. He said his reforms must be included in any legislation addressing the status of the nearly 700,000 recipients of Deferred Action for Childhood Arrivals, a program he rescinded in September, giving Congress six months to figure out a permanent solution. If you enjoyed reading this article, support our independent journalism by sharing it online. Thank you!